This estate is the perfect setting for an elegant country event where the atmosphere of the authentic Tuscan countryside can be enjoyed. 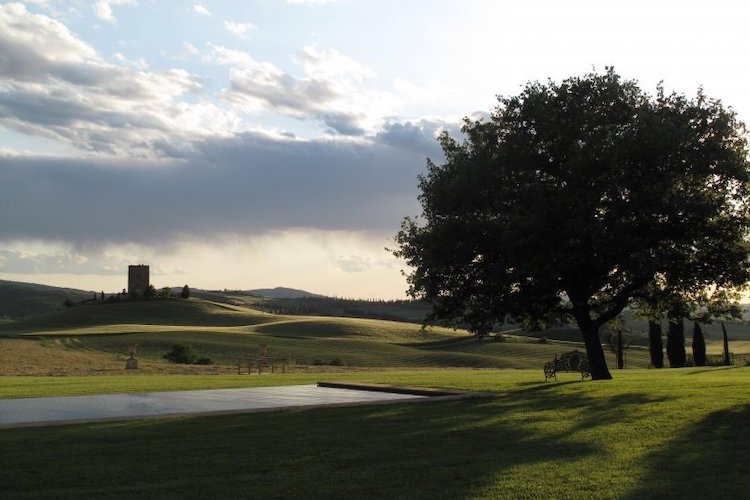 A beautiful completely restored estate dating to the 1500s, that is located in the heart of the Val d’Orcia and surrounded by an iconic and unforgettable view. Featuring original terracotta flooring, antique furniture and precious fabrics, it offers a refined and elegant setting. Outside the vast garden with perfect lawn can host a seated reception for up to 120 guests with the option to set up a tensile structure in case of bad weather. The splendid heated swimming pool is the ideal setting for drinks at sunset. Another internal garden is ideal for symbolic or civil ceremonies. With its six rooms, each featuring typical woodbeam ceilings and private bathrooms, the estate can host twelve guests. Every room has a unique view over the hills that roll into ravines and moonscapes, fields of wheat, country lanes lined with cypress trees and medieval towers in the distance. The rich breakfast with local products and homemade cakes can be served outside during summer months. The perfect location for a classy and impeccable wedding in the Val d’Orcia.